Updates to this page coming soon! 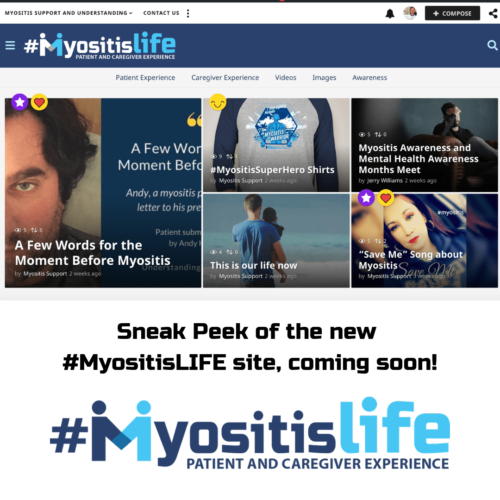 This year we are promoting a longterm investment in awareness and education through our new interactive, patient- and caregiver-centered #MyositisLIFE website. Get ready to share your experiences living with and caring for those with myositis. We are looking for those who enjoy writing about their experiences, including those who wish to join us as an ongoing author. You do not have to have writing experience. We will help you! Our stories as patients and care partners have the ability to help family and friends better understand what myositis is and how it affects our lives. Our experiences also help others living with myositis to learn they are not alone and can help supporters, industry, and the research community gain interest in these rare systemic muscle diseases. Some of the various ways you can share your #MyositisLIFE include topic-based writing. sharing through images and with video. Want to get started now? Simply email us with your information and idea for a topic(s) you want to write about and we will advise you on getting started. 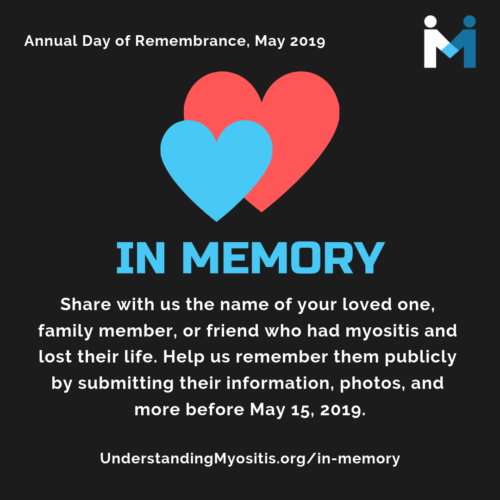 Share with us the name of a loved one, family member, or friend who lost their life fighting Myositis so they can be featured on the live YouTube streaming video event that will take place during Myositis Awareness Month, May 2019. In previous years, MSU has asked the community to observe a moment of silence; this year in addition to a private moment of silence, we are doing more to ensure we never forget those who fought so hard, in participation with several caring sponsors committed to the myositis community and research. While honoring their memory and expressing the sadness of these losses–losses that mean a great deal to our community–we can help others realize the urgent need for continued education at all levels, new and effective therapies, rare disease patients to get involved in clinical trials, and better understanding and increased awareness, all keys in helping to fund nonprofit work and myositis research. Promoting Awareness of Myositis can be as simple as talking to your family members and friends about your experiences, ways they can help support patient-centered myositis nonprofits like MSU, and ways they can learn more and get involved. There are other ways you can help make an even larger impact. Utilizing some of the ideas below can help spread the word to a larger audience. We are happy to help you in any way we can. Contact us and let us know what you need to make your awareness promotion and fundraising event a success. Contact your local TV station or community reporter to go on a local TV show and tell your myositis story. Make it personal to your experiences with myositis and include a very brief explanation about myositis, the importance of awareness, and a little about MSU. We are happy to help you with wording. Just contact us! Contact a local reporter and request they write an article about Myositis Awareness Month that includes your personal experience with myositis and a little about MSU and how we help Empower the Myositis Community. Contact us for help with wording. Write and share your myositis story and include some information about MSU, which can be found in the Awareness Toolkit, or contact us for help with wording. Submit to several local print and online publications. Be sure to check their guidelines prior to submission. An important way to help promote awareness and understanding is to ensure those who make policies affecting our care are well-educated about myositis and how it impacts our lives. Contact your local, state, and federal officials to schedule a meeting. Share your personal myositis story along with how they can contact MSU for more information. Order information cards and brochures to provide them with during your meeting. In just 2 hours, you can start off your colleagues’ day by providing a simple breakfast of bagels/muffins and juice, have a brown bag luncheon where you provide dessert, or step out for a lunchtime walk with your colleagues. These are times when you can educate your co-workers about myositis and how it affects you personally, and tell them about why you support MSU and ask if they would make a donation to help empower the myositis community. You can order brochures and information cards to hand out as well in our <a href=”https://understandingmyositis.org/shop”>Shop</a>. A house party is an event, held in your home, in which you invite people you know, and set up to have a featured event during this time like movies, games, contests, or other creative ideas. Offer light refreshments, lunch, and/or drinks and during this event, provide your guests with <a href=”https://understandingmyositis.org/shop”>MSU materials</a> and have a fundraising contest. Be creative! When posting to social networking sites, utilize the some of the below hashtags to build upon community-wide myositis awareness content. Learn more about <a href=”https://understandingmyositis.org/use-hashtags-promote-myositis/” target=”_blank” rel=”noopener”>using hashtags in social content</a>. Order <a href=”https://understandingmyositis.org/shop”>MSU brochures and information</a> cards through our Shop and hand out to family members and friends, local businesses, physicians, and other healthcare facilities you visit. This is a perfect time to ask if they would support you and MSU with a donation of any amount, either online, via check payable to MSU, or through your own MSU fundraiser. Request a proclamation from your Governor and/or Mayor of your City. Below you will find a download for the proclamation guide and a list of web links for each State, making the request process easier this year. The proclamation sample wording and list of State contacts are also available in the Awareness Toolkit. Purchase “Myositis In Focus” Awareness themed gear in our Cafepress Shop for yourself and as gifts for your family members, friends, coworkers, and others. Offering awareness themed golf balls, apparel, maternity apparel, dog shirts, drinkware, lunch bags, totes, and much more. Get myositis wristbands, information cards, brochures, pens, and bundles in our onsite shop. Join us as a member and you will receive email updates when new awareness materials are available and you will have your very own MSU Myositis Network account and profile, and much more. We are working to improve our onsite community, along with many other tech updates and offerings. Creating your own MSU Myositis Fundraiser on Facebook is so easy! Visit the MSU public Facebook page fundraiser section, and under the header graphic/video, click the blue “Raise Money” button to get started. Then, customize the image and wording to make it personal to you. Once ready, complete and start sharing. Share your fundraiser, with updates. often. Crowdfunding campaigns can be a ton of fun! Ask your family members and friends to join the team and then start sharing the campaign. To get started, click the button below to visit the MSU Crowdrise campaign. Then, click the orange “Join the Team” button! Posting frequent updates with photos for better success! As a nonprofit, we rely on donations for the work we do. We hope you will make a contribution. We appreciate your support! If you would like to make the donation in honor of or in memory of your loved one, please include a note with the information. Utilize the resources provided in the 2018 Myositis Awareness Toolkit to make a larger impact! Toolkit updated May 2, 2018, at 11 pm EDT.